With a loud bang at my door I became instantly awake. Quickly pulling some clothes on, I rushed to the front door, then slowly opened it. Peering around the door's edge I met face to face with a Fed EX delivery man. With a smile he said, "Did I get you out of bed?" Some what embarrassed I replied, "Yes, worked late last night." After I signed his electronic delivery pad he handed me a large box. With elation on that late September day I took the parcel into my home and opened it. Inside the package were two boxes. Both box covers displayed a colorful mystical illustration. The title on the larger box read, "The Journey to Wild Divine" followed by, "The Passage." 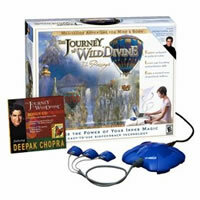 On top of the smaller box it read, "The Journey to Wild Divine" accompanied by, "Wisdom Quest." Soon all the contents of the boxes were revealed and I was installing the new biofeedback program onto the hard drive of my new computer. After the software finished installing, it asked me to go to the "Wild Divine" website to get an activation code to activate the program. Once the biofeedback program was activated I plugged the dark blue "Light Stone" into one of my computers USB ports. Then I ran my hand back to the opposite side of the Light Stone where a short cable is attached. This short cable leads to three smaller cables. At the end of each of these three short cables are three dark blue Magic Ring sensors. These rings determine a player's Skin Conductance Level (SCL) and Heart Rate Variability (HRV). SCL is a measurement of sweat gland secretions an individual is producing. SCL is also an indication of an individual's nervous system activity. Nervous system activity is a reflection of when a person is in a positive (excited) or negative (nervous) emotional state. HRV is a mathematical difference between one heart beat to the next. Individuals who live long and happy lives generally have a greater HRV. Certain lessons in "The Journey" require players to obtain this greater HRV. The Institute of HeartMath is an organization researching the effects of greater HRV. Research by Heartmath shows that when the heart obtains and then stabilizes at certain frequencies the brain responds by synchronizing itself with the heart, which results in an enhanced immune system. When the heart and brain are in a synchronized state a doughnut shape magnetic field is formed. Certain instruments are able to detect this synchronized electromagnetic heart field up to 8 feet away. Research shows that when an individual who has obtained this synchronized state touches another person who is not in a synchronized state his or her brain will react and move towards a more synchronized state. "The Journey to Wild Divine" teaches how to obtain and maintain this HRV state by mediation, slow deep abdominal breathing and controlling one's emotional states. One advantage "The Journey" has over other biofeedback devices is in teaching the effect emotional states have upon our body's rhythms. Some sessions ask you to raise your energy level while others ask you to bring it down. In one particular session all that is asked is just to be an observer of how your day to day cycles affect the rise and fall of a balloon. In order to progress through a particular lesson the player may have to raise or lower his heart rate or sweat gland activity. Several of the sessions will not allow you to progress to the next lesson until you master the current one. One particular benefit is the replacement of old breathing and emotional habits with new ones that are taught in the game. Eventually a player realizes they can change their emotional states simply by altering their breathing. The goal is to carry over these new habits and skills into normal daily life. "The Journey" uses mythical characters and a mystical kingdom. Sophia is the first mythical character encountered and is the prominent guide in the first program called "Passages". Other masters, mentors and teachers appear along the way each teaching a specific lesson. An example is the Lady of the Woods who lives in the Forest of the White Wolf. She teaches the player to breathe rhythmically by use of a fire place bellows. A bellows near the fire place attempts to make the fire grow. The goal is for the player to breathe to the rhythm of the bellows and make the fire burn brighter. Note: each teaching builds upon the next. What was learned in a previous session may need to be used in a future lesson in combination with material learned from previous instructions. For example in the Temple of Awareness with the Mentor Mila-Rugom, one of the four exercises is a game that requires a player to hit a target by raising or lowering a bow and arrow. In order to raise the arrow the player must do steady deep breathing as was learned from the Lady in the Woods. Alternatively to lower the arrow, the player must breathe lightly as taught by the master in the temple. When the game begins a player is given a magic wand that acts as a navigational tool to go between scenes. A white swoosh of stars is an indication of a direction to go to. To move to the next scene click on the swoosh of stars with the wand. A map of the magical kingdom is available by pressing the letter "m" on your computer keyboard. Sometimes when the wand passes over an object a colorful smoke may appear. If smoke appears it means there is a lesson to be learned. Click on the smoke and follow the directions. Near the beginning of the game the player will be given a magical bag from the Lady of the Woods. This bag is used to collect gifts from certain areas within the game. Gifts include items like a rose or magical sphere. In "Passages" alone there are over 40 lessons to be learned. "Wisdom Quest" has over 20 deeper lessons. A companion book comes with each program, and many details about each lesson are given in these two books. Read the chapters you are on before participating in the game, since valuable instructions are given. Each book is written as an adventure story of a seeker on a mystical / spiritual journey. The first few sessions are easy to understand and move through. Because of this, as a student moves deeper into the course, he may think he has mastered a lesson. However, as a student progresses deeper into the material, he needs to slow down at each lesson and repeat it at least for several days to a week before moving on. In other words try not to let the speed at which the first sessions were covered became a habit for moving ahead to fast. Develop a habit of slowing down at the start; this will give you the patience for the more challenging training latter. Several breathing techniques are taught: two examples are "The Peaceful Breath," and "The Lions Breath" The first one helps to calm you and the latter energizes you. "Journey" demonstrates several physical exercises. These exercises involve stretching and twisting of the body. Other exercises incorporate visualization techniques such as raising your real arm then putting it back down, then with your imagination, raise your ethereal arm and lay it back down. Visualization skills are taught as well, such as, for example, imagining an apple in the mind's eye. In this exercise you visualize an apple tree growing from a tiny seed, blossoming with flowers to producing fruit, and then eating the apple. The bio-feedback game helps with remote viewing in the following ways. First, "The Journey" teaches one how to get into a deep relaxed physical, emotional and mental state. Second, it teaches how to quell the internal chattering of the mind, leaving the mind in a relaxed focused silence. This focused silence is crucial to getting good remote viewing results. It improves RV results by allowing anomalous external material, which previously had been stored in the deep subconscious to surface and become aware to normal consciousness. There are several hints I would like to pass along. First, if the program or magical rings are not properly responding use a little lubricating jelly on the tips of the fingers. Second, I found some sessions responded best when I used Edgar Cayce's deep breathing exercise. Cayce's deep breathing exercise is described as alternating deep breaths between the nostrils and mouth. Third, warm your fingers prior to putting the magical rings on. Cold fingers tend to reduce the efficiency of the rings. Lastly, stimulants like caffeine and muscle relaxants will have an effect on ones performance. In conclusion, the scenery or graphics of "The Journey to Wild Divine" are incredibly beautiful and the music inspirational. Moreover, the instructions are easy enough to understand that a novice would be able to follow them. Lastly, "The Journey" is like having one's own personal yoga master living with them.